Wheatcroft Homes to deliver nine new homes on the site of a former warehouse. Construction has begun on Swing Bridge Wharf, a residential development in Moira by developer Wheatcroft Land under its new residential brand, Wheatcroft Homes. The site of a former warehouse, located in the heart of the National Forest, will be turned into nine new homes. 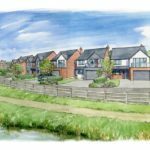 The redevelopment overlooks Ashby Canal and will include a mixture of three- and four-bedroom family homes including both semi-detached and detached properties. Catherine Haward, Director of Wheatcroft Land and Wheatcroft Homes, said: “Interest in Swing Bridge Wharf has already been strong, even though we’re only just putting the first spade in the ground. This is a really unique location and one that we’re really excited about seeing completed. There’s easy access to country parks, nature walks, cycle walks and even boat trips at the Moira Furnace Museum. Swing Bridge Wharf is due to be completed in time for residents to move into their new homes for Christmas 2019. This is the second residential scheme the developer is currently working on in the East Midlands, with another 14-unit scheme underway in Ancaster, Lincolnshire, expected to be completed this summer.